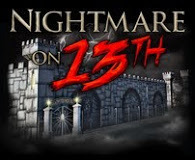 The Nightmare on 13th is well known for constantly changing. We work year around to create highly realistic sets and over the top special effects that our guests have come to expect. This year’s Nightmare is no exception, it takes you to the darker side of Halloween. The new and improved Nightmare Courtyard will be your first stop. Once inside, you will encounter the legendary story of Sleepy Hollow, tread carefully or you may just lose your head. Back by popular demand, Dark Harvest has returned for its revenge. And finally why do the sewers echo with laughter and smell of cotton candy? IT is here! All this and much more will prove to you why Nightmare on 13th is truly Utah’s Legendary Haunted Attraction. Take $6 off for Utah Kids Club families. To redeem the $6 off MONDAY - THURSDAY take the promo code "MT186W" online and enter in the code when purchasing tickets. Take 4.00 off Friday and Saturday with coupon code “AD183W”. Purchase tickets online then present valid Utah Kids Club card when you come haunting!